The sentiment I shared earlier last week about bomber jackets being made by everyone is the same that I feel about saddle bags this season. This is a shape I really love for its simplicity, elegance, and functionality. 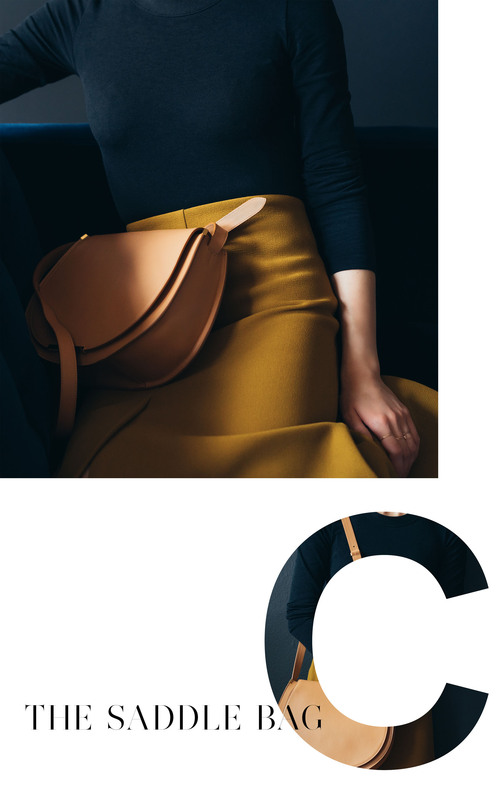 The newly-launched saddle bag by Cuyana immediately caught my eye and I knew I had to get my hands on one. I've long admired Cuyana products for their quality and attention to detail. Their version of this bag is beautiful and sleek, and I'm a sucker for anything in a smooth Vachetta leather, as I imagine the color will deepen with use and gain so much more character. The bag also comes in a mini size (but it fits an iPhone 6s plus!) which is extra charming. Aside from the beautiful bag and the fact that you are always on point with all things fashion worthy, you're photos and perspective are out of this world. But I am seriously in love with your photography and that's a fact. Gorgeous bag! I have a similar one by KL. Incredible photography. I love the moody vibe and the colour palette that you've chosen. The mini version got me, big time! Your posts are always so artistic. I love the whole atmosphere you've created. That bag is stunning, and now I'm seriously considering a saddle bag. I love these photos as well, the color scheme is so dreamy. Hi Alice, was wondering if you could do a review or a short write up on your Sony a7r. It certainly produce very good images, on top of your skills of course ! You are a genius. What a marvelous editorial style this post has. The colours, lights, textures! Stunning. Hi Alice, where did you get the lamp from? The lamp is from Rejuvenation! Hi, who is the photographer? In addition to the purse, I'm in love with your skirt. Where is that from? The skirt is from COS! Fantastic outfit. Could you please share where your top is from too?